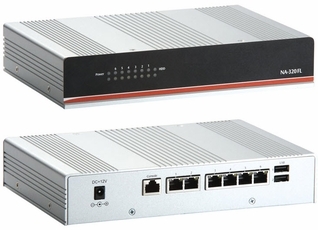 The NA-320FL fanless 1U compact network appliance platform with six Gigabit LANs supports the low-power Intel Atom processor D510 1.66GHz with Intel ICH8M PCH chipset. The NA-320FL supports a high bandwidth DDR2 SODIMM slot with memory up to 2GB. To prevent problems from sudden shutdown, this fanless platform supports a LAN bypass function through WDT and GPIO pin definitions. For extended networking application, the NA-320FL comes with a PCI Express Mini card (USB interface). Moreover, the compact unit features one 2.5" SATA HDD, one CompactFlash slot, a console port and two USB ports, which enhances its capability to deal with various application needs. Furthermore, the NA-320FL comes in a small form factor with a height of 44mm and a weight of 2.5 kg. It can easily fit into any space-limited and harsh environments. 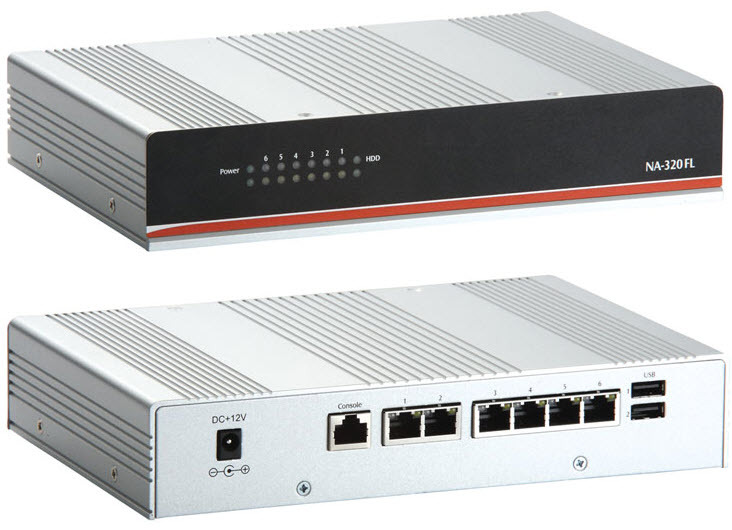 Axiomtek's NA-320FL network appliance platform is an excellent choice for applications in VPN, content filtering, UTM, network security gateway and firewall.